Hartzell Propeller is giving four lucky attendees of the Sun ‘n Fun International Fly-In and Expo the chance to win a ride with Team AeroDynamix, the world’s largest aerobatics team. To win, we want you to show us how you prepare for Sun ‘n Fun. Take a picture of yourself, your family or (even better) your plane getting prepped for the big show. Then, upload the picture to your favorite social network and tag it #FlyWithHartzell. Here are the details: Hartzell is giving away four seats with Team AeroDynamix. Winners will ride two at a time on Saturday morning, April 5. The first pair takes off at 8AM, and the second will fly at 10AM. Although we are proud sponsors of Team AeroDynamix, we cannot provide tickets to Sun ‘n Fun. In order to win, you must be able to attend at these times. Winning passengers must be 18 or older and cannot exceed 210lbs per person. Winners will be required to sign a passenger waiver, which will serve as their ticket. 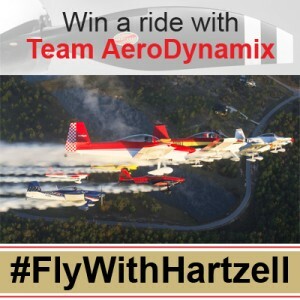 Enter today by posting your pictures Facebook, Twitter, Instagram or Pinterest and adding the hashtag #FlyWithHartzell. Winners will be chosen at random, but we really want to see your best shots as we prep for this once-in-a-lifetime opportunity. We will announce the winners live on April the 2nd; they will be featured on the Hartzell blog, meet members of the Hartzell Propeller team and take off with Team AeroDynamix on the 5th. Want to see what else we’ll be doing in sunny Florida? Click here.